Kite is something children all over the world play with. But the history of kite flying is a long tale stretching back over 3000 years long before the written word was invented and there are different theories regarding how kite was invented. There is a large group of people who believe that China is source of this invention but at the same time some people are of the view that Indonesia and Malaysia wee the countries who came out with this invention as they started making kites from leaves and they share a long history of Kite flying also. With the passage of time shapes of kites started changing and new shapes like tail-less diamond, tetrahedral kite, flexible kite and sled kite came into market. Kite flying is very popular in China, Japan, Pakistan, India, Indonesia, USA and many other countries of world. Japan celebrates kite festival every year in first week of May. The sky that week doesn’t remain the same like the rest of the year as it’s filled with colored kites all over. China also celebrates kite flying once a year as people from all over China gather at a single point to fly kites but the thing that is different from other festivals is the hand crafted kites. Indonesia holds the oldest festival of kite flying as it lasts for 2 days. USA also celebrates this event on beach of Peninsula and it also happens once a year in August. India also celebrates it like a festival mainly in Gujarat as they have public holiday on this particular day. Same goes for Pakistan as they also celebrate kite flying in spring and it is celebrated in main cities like Lahore, Rawalpindi and Karachi. Festivals are arranged in accordance and kite flying is at its peak with lots of music and dance on the roofs of houses but sadly from the past some years Kite flying in Pakistan is not the same as before as Supreme Court of Pakistan has passed an order to ban kite flying as people have started dying from the chemical which children use to fly kites. Kite flying craze is not limited to psychical or real world as it has acquired virtual world also. You can see many games on internet for Kite flying as “Kite Fever” is one of the top games for Android. 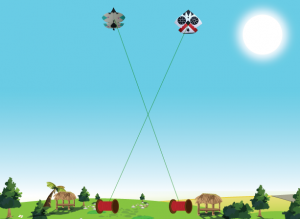 Similarly “Kite Fights” (www.kitefights.com) one of the best online multiplayer kite flying and kite fighting game . Kids love to play these games who cannot do this in real and in return they learn to fly kites also. You don’t have to download it you can just play it online and have all the fun you want with all the colorful kites in the sky and you are cutting kites of other people. Lastly kite flying indeed is a fun thing to do as it can give you a great time to spend but not with anyone’s blood. If it’s all safe then kite flying is much more fun than sitting home and seeing movies and wasting time which can be spend doing something physical and having fun.